The Ambassador of Turkey to Pakistan H.E. Mr. Ihsan Mustafa Yurdakul appreciated the role of ECOSF for promoting Science, Technology and Innovations (STI) in ECO region. He also applauded ECOSF for providing the platform to the scientific community of the region for sharing knowledge and for developing collaboration. 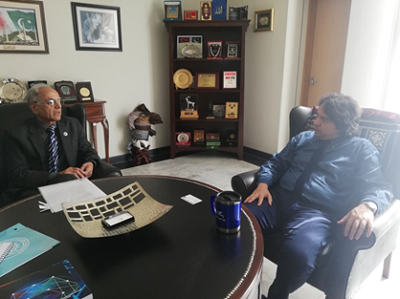 He made these remarks during a Courtesy Call upon him by President ECOSF Prof. Manzoor H. Soomro on 22 October 2018 at Embassy of Turkey in Islamabad. Earlier, the Ambassador warmly welcomed President ECOSF at his office and shared special bounds with Pakistan. Prof. Soomro gave an introduction of specialized agencies of ECO and the process of establishment of ECOSF in Islamabad in December 2011. He further mentioned that the ECOSF is a sister organization of ECO Educational Institute based in Ankara, Turkey. President ECOSF shared with Ambassador the programmes and activities of the Foundation for promotion STI in the region including the research project funding, Travel Grants for researchers and implementation of Inquiry Based Science Education (IBSE) in ECO region of la main a la pate Foundation (LAMAP), ISTIC Malaysia and IAP SEP.
President ECOSF also mentioned to the Ambassador that the Foundation has developed strong working relations/collaborations with international and regional organizations and development partners, such as UNESCO, Islamic Development Bank, International Science, Technology and Innovation Centre for South-South Cooperation under the auspices of UNESCO (ISTIC), Malaysia, La main la pate Foundation of France, China Association for Science and Technology (CAST) and its Children and Youth Science Center (CYSC), Korea Institute of Science & Technology Evaluation and Planning (KISTEP), Turkic World Educational and Scientific Cooperation Organization (TWESCO), Astana and many other organizations. During the meeting, the Ratification of ECOSF Charter and its Additional Protocol by Turkey as main agenda item came under discussion. President ECOSF requested the Ambassador to support and pursue the ratification process at the government level so that the process may be completed soonest possible. The ratification will also make the Foundation stronger to work vibrantly. The Ambassador assured his support to follow the process of ratification of ECOSF Charter and its Additional Protocol. H.E. Mr. Yurdakul thanked the President for visiting the Embassy and updating him about the Foundation. At the end, President ECOSF presented the Foundation’s Annual Report – 2017 to The Turkish Ambassador to Pakistan.